Crunchy French Bean, Sugar Snap Peas and Black Edemame. 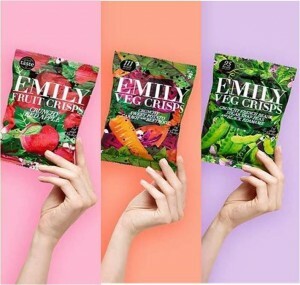 Emily Crisps was founded in 2014 by partners Emily Wong and Alex Ascani as a healthy, great tasting alternative to traditional potato crisps and fruit snacks. Its aim is to provide health-conscious consumers with the opportunity to indulge in guilt-free snacking, offering the goodness of fruit and vegetables in a crisp with great crunch and taste. Originally launched exclusively in Selfridges, it has grown significantly over the last two years and is now stocked in over 1,000 retail locations in over ten countries. First launched with three fruit crisp varieties, the brand has recently expanded its offering with the introduction of two new vegetable crisp varieties. Posted February 15th, 2018 in Offers & Competitions. Tagged: designer dress hire, Dress Hire, dress of the week, Dresses, Emily Crisps, Evening Dresses, Girl Meets Dress, Girl Meets Dress and Emily Crisp, Gluten Free Crisps, GMD, Halal Crisps, Healthy Crisps, Healthy Snacks, hire a dress, hire celebrity dresses, hire cocktail dresses, Hire dresses, Kosher Crisps, Low calorie snack, rent a dress, rent celebrity dresses, Rent designer dresses, rent dresses, short dresses, Vegan Crisps.